Lucia stopped gushing at the cleverness of the Universe and picked up her shovel again, "Hell's bells, now I know why Australia is called godzone country. Violetta, you don't say much anymore, you know that?" "Oh," Vet wondered what in the world could be said other than a grunt and silence. When Fire Jumps: a magic realism novel about the random nature of love and loss. 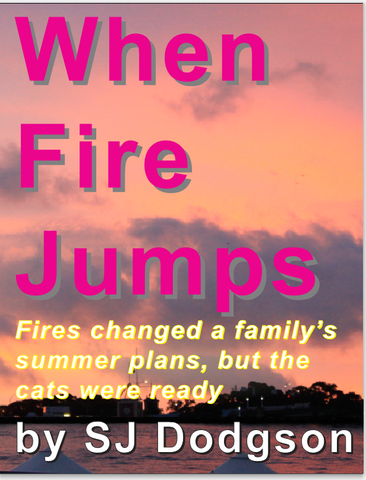 A family makes plans for summer, and the fires come. Some will live and some will have to rebuild lives from the ashes. One thing is sure: love and hope never dies. 'Lucia was on the floor on the marble tiles, lying on her stomach, watching tropical fish swim in and out of the air bubbles rising from the bottom of the fifty gallon aquarium. The white cat was on its back beside her, watching, pawing the air as an iridescent blue butterfly swooped and soared around the room. The marmalade cat lay along Lucia's legs, licking the sole of her bare right foot..."
Only Frank and Eve were left at the side of the swamp, holding hands, remembering. Frank shook his head sadly, "Eve, a lake was here when we were on our honeymoon. July. Six months ago, and now its completely gone. No water flowing. Things change so fast." This book is a work of fiction based on real events. The author had four brothers, no sisters, and has three sons, one daughter. Names and characters either are products of the author’s imagination or are used fictitiously. Any resemblance to actual persons, living or dead, is co-incidental. All rights reserved, including the right to reproduce this book or portions thereof in any form whatsoever. For information, Emerald Pademelon Press Subsidiary Rights Department, PO Box 381, Haddonfield, New Jersey 08033. First Emerald Pademelon Press ebook edition November 2014. Cat drawings (c) Miles Conrad Dodgson Pekala 2001-2014. Front cover drawing (c) Susanna Jane Dodgson 1997-2014. Library of Congress Cataloging-in-Publication Data. This book is dedicated to the memory of an older brother, William John Dodgson (August 1950 - October 1950); to those who loved Janet Engel (1970-1998) of New Jersey and Karen Baker (1958-1974) of New South Wales; and to the volunteers and staff at Camp Howard who gave me wonderful Blue Mountains escapes from pre-university madness. My husband, Ernst Lothar Blossfeld Dipl Physik (Heidelberg), whose financial support of myself and my children made writing this book possible in Breitnau in the Black Forest of Germany. So many fires have jumped over him, born in Nazi Germany during the Holocaust to Ruth Noerdlinger, the daughter of a Jew. My mother HP Uprichard Dodgson MB BCh (Belfast) and father MCH Dodgson MD BS (London) MRCPath: whose need to get out of England after the devastating damage of the Second World War made sure my brothers and I grew up in sunny countries. My advisers at UNSW, Professor EOP Thompson PhD, Assoc Professor RAB Holland MD and, for 18 years, my mentor and Chairman at University of Pennsylvania Professor RE Forster II MD, FNAS. You took me on, and brought out the best in me. My children Angus Zoltan Dodgson Pekala BS, MS; Miles Conrad Dodgson Pekala BEng; MEng, Allister Michael Dodgson Blossfeld BA; and Patience Caroline Blossfeld Dodgson (undergrad): you have made me believe in the future.